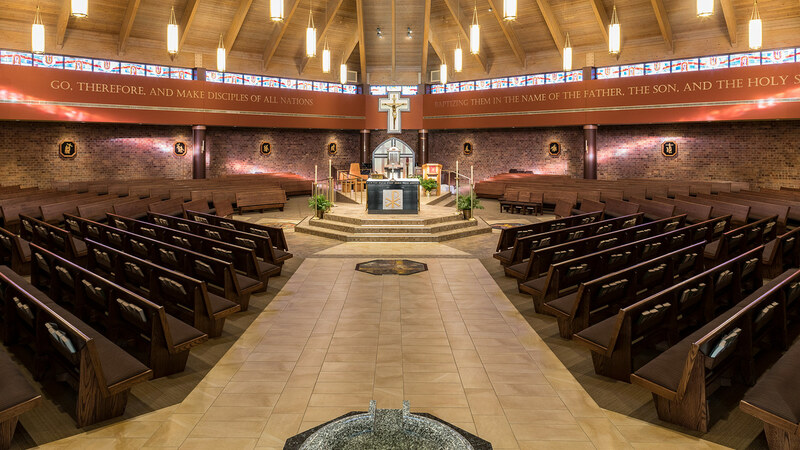 TSP’s work with Holy Spirit Catholic Church began as an update of the nave’s finishes and lighting. 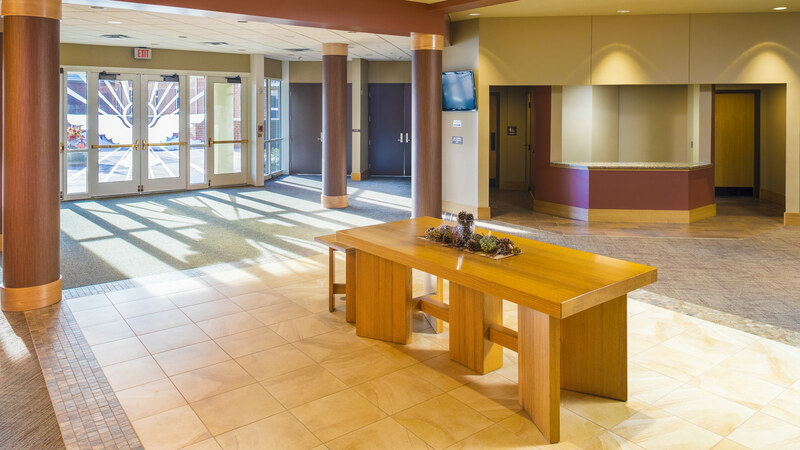 Our team knew we’d modernize one of our own earlier designs in the process: TSP provided engineering services for Holy Spirit’s original design. But as our architects and interior designers visited with parish leaders, it became clear they had a bigger vision. 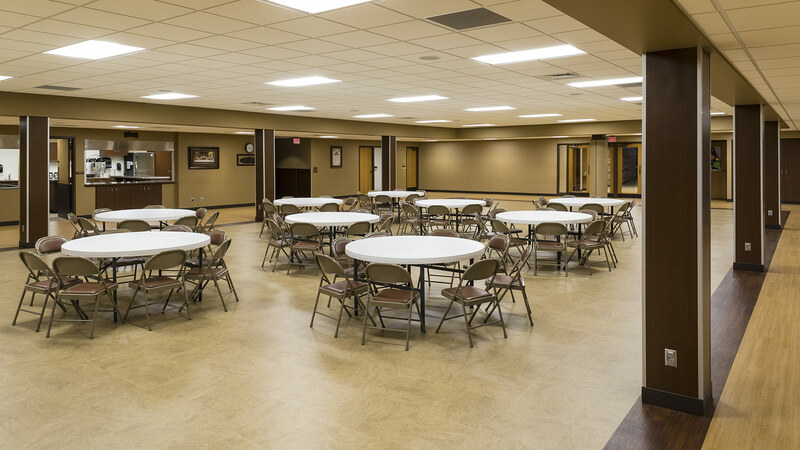 The final project touched nearly every functional area of the Church, including offices and rest rooms, the sacristy, and the lower-level parish hall with its kitchen. In the process, the TSP team added created a more straightforward liturgical layout for the sanctuary. A central-access aisle now runs diagonally through the space, improving flow for celebrants and parishioners alike. The reorganization increased seating capacity by 20%, even after we removed pews from behind the altar platform. 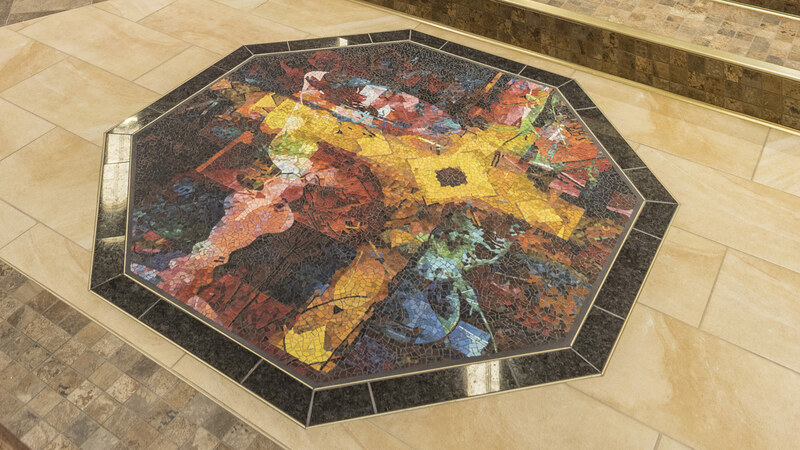 Original floor mosaics designed by internationally recognized artist Scott Parsons became an integral part of the worship space’s transformation. Parsons, a frequent TSP collaborator, developed five pieces around themes that resonate with Holy Spirit’s congregation: the chalice and the cross, the lamb, loaves and fishes, and the pelican―a symbol of atonement in the early Catholic faith. 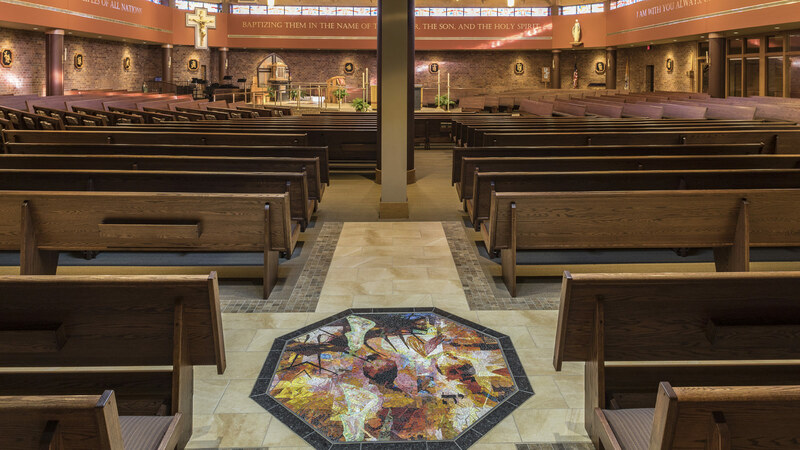 The final theme, divine mercy, is embodied in the mosaic inside the side chapel. The TSP team’s goal was to strike a balance between more traditional elements and the building’s more contemporary architecture. In fact, the orientation of the mosaics themselves serves almost as a compass, suggesting a gothic-cross arrangement within a square sanctuary. 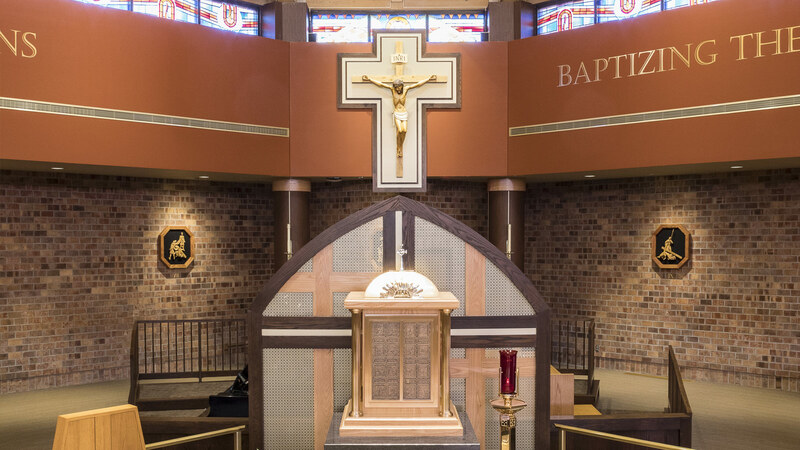 TSP worked with other artisans to incorporate custom granite fabrications such as a new baptismal font with pump fountain and a new altar with relics embedded in the design. Other features direct the eye to key focal points. Bold colors on the perimeter soffit bring a sense of warmth while offsetting scripture verses on either side of a stylized crucifix. A new tabernacle rests atop a custom granite pedestal, elevating its visibility in a central location (the old tabernacle was housed in the side chapel). A partial screen behind the tabernacle serves as a backdrop and also separates the choir area. New pendant light fixtures use energy-efficient LED bulbs.